In 2015, Whitman experienced a large surge of young professionals and students who moved into blocks previously occupied by single families. Single family homes still make up the majority of neighborhood occupants, as the Whitman Council fights to preserve the single-family nature of its housing. The Navy Yard reports Whitman to be one of the most desirable neighborhood for Navy Yard young professionals due to its proximity to the Navy Yard and nearby amenities. According to the 2000 Census, Whitman, combined with Queen Village and Southwark, has 26,300 inhabitants. The racial makeup of the community is White, 60 percent; Black, 27 percent; Asian, 8 percent; Latino, 5 percent. About 40 percent of the population is under 18. Whitman has a very large population of Irish Catholics.. The 2010 Census showed progressive changes in demographics, including an increase in total inhabitants, with a marked increase in Asian American and young professional population. Whitman Plaza shopping center, Fourth Street and Oregon Avenue. The George Sharswood School and SS United States are listed on the National Register of Historic Places. The School District of Philadelphia operates public schools in the Whitman neighborhood. George Sharswood Elementary, 2300 S. Second St.
John H. Taggart Elementary, 400 Porter St. Neighborhoods assigned to Sharswood are also assigned to Furness High School. The Free Library of Philadelphia Whitman Branch serves the community. Joey Coyle, who stole $1.2 million that fell from an armored truck. His story was developed into a 1993 movie, Money for Nothing, starring John Cusack. 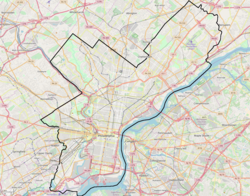 Jim Kenney, the 99th mayor of Philadelphia, grew up in the Whitman neighborhood and once served as a board member of Whitman Council Civic Association. Whitman Council, which holds monthly meetings and distributes bimonthly newsletters. ^ "The place where you live: Whitman". ^ "The 2010 Census | Philly". www.philly.com. Retrieved 2015-10-23. ^ "Whitman Neighborhood: Up and Coming South Philly". Philadelight Magazine. Retrieved 2015-10-23. ^ "George Sharswood Elementary School Geographic Boundaries" (Archive). School District of Philadelphia. Retrieved on November 29, 2015. ^ "John H. Taggart Elementary School Geographic Boundaries" (Archive). School District of Philadelphia. Retrieved on November 29, 2015. ^ "A Directory of High Schools for 2009 Admissions" (Archive). School District of Philadelphia. p. 15 (PDF p/ 17/40). Accessed November 6, 2008. ^ "Horace Furness High School Geographic Boundaries" (Archive). School District of Philadelphia. Retrieved on October 4, 2011. ^ "Whitman Branch." Free Library of Philadelphia. Retrieved on October 19, 2012. ^ "Whitman Plaza". www.whitmanplaza.com. Retrieved 2015-11-09. ^ "Whitman Council Inc". whitmancouncil.org. Whitman Council. Retrieved 2016-10-05. This page was last edited on 11 July 2018, at 14:02 (UTC).